Welcome back and thanks for kicking your weekend off with us at Frilly and Funkie. Linda Coughlin here with Saturday StepxStep. It will be a regular post at Frilly and Funkie where our designers will share with you the various steps and techniques they used on one of their projects. Today, as promised, I am going to break down the steps I went through to create the design team sample I shared here on Wednesday. 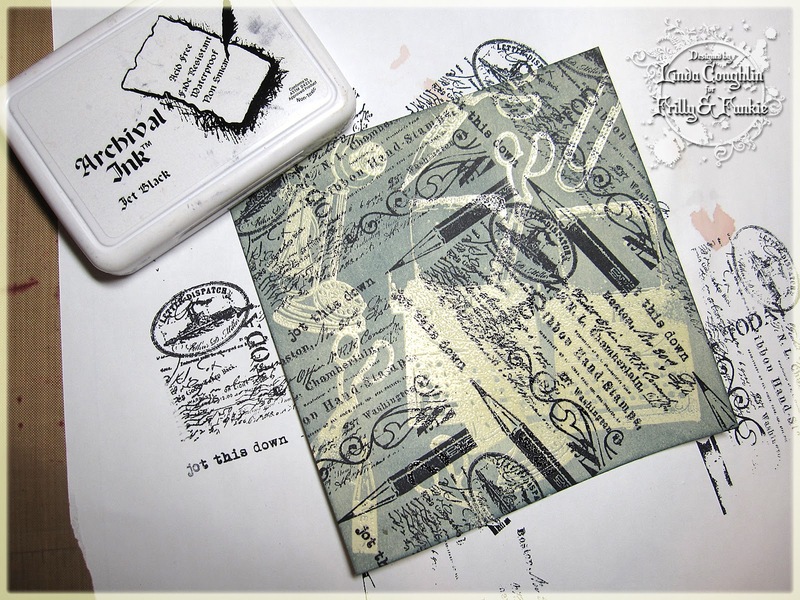 It features images from a brand new Artistic Outpost stamp release Secretary Pool. After high school, I trained to be a secretary. I never worked as one, but I had the training in office procedures, typing and shorthand. 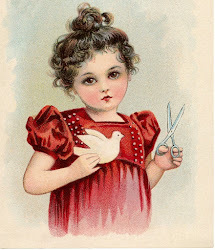 Consequently, this set chocked full of vintage office images has great appeal to me and I so enjoyed making this card. Don't forget, you can double click the images and they will open up huge so you can see all the details. 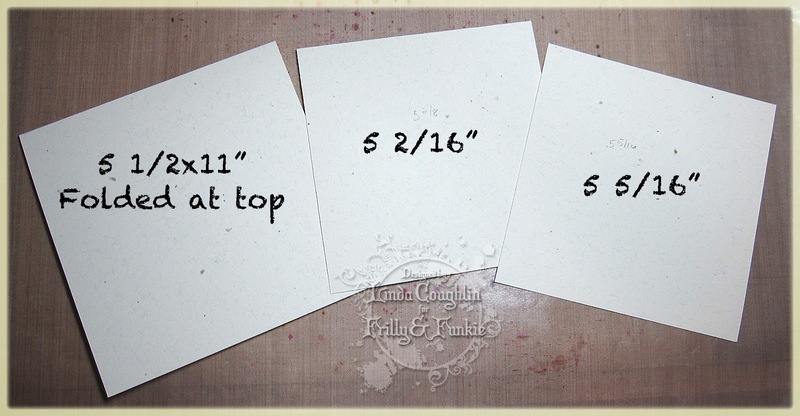 My standard size card is a 5.5x5.5" square and I cut the layers as shown below from confetti cream CS. The outer shell was sponged lightly along the edge with Weathered Wood DI. The next layer in was first sponged along the other edge with Vintage Photo, then scissor distressed and then the edges were sponged again with Vintage Photo. 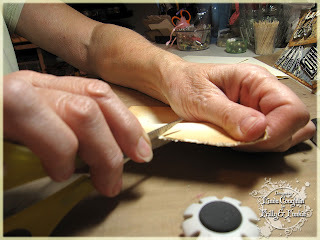 There are a number of ways to rough up the edges of your paper. You can see a distressing tool in the foreground and I do use it occasionally, but my preferred method is using scissors. Open the blades about a half inch and rake the scissor blades along the edge of your paper. I like the look of that type of distressing best plus you get some interesting rips and tears, especially if you are distressing paper as opposed to card stock. Be careful because paper rips really easily when scissor distressing. Even though I had already ink distressed the edges, I do it again after distressing to cover up the white edges revealed by the distressing. 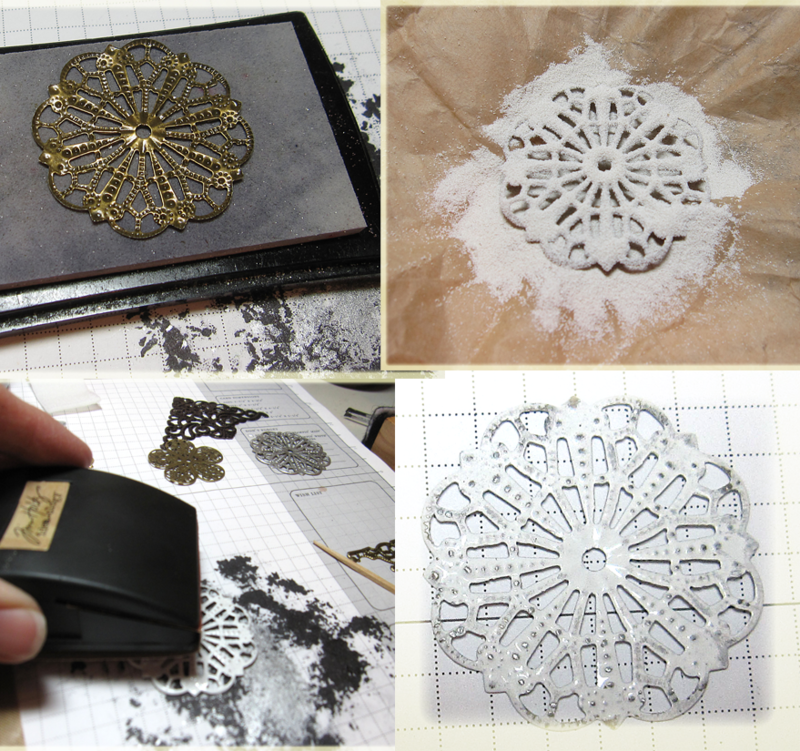 Next I clear embossed images from the set in a random pattern using a clean Versamark pad. I have several Versamark pads, but when using clear EP on light CS, you need to make sure you are not stamping with gray dingy Versamark. Using Weathered Wood DI, I sponged the entire panel. Next I stamped the script/vintage label stamp from the set over the entire piece using Ranger Jet Black Archival Ink. 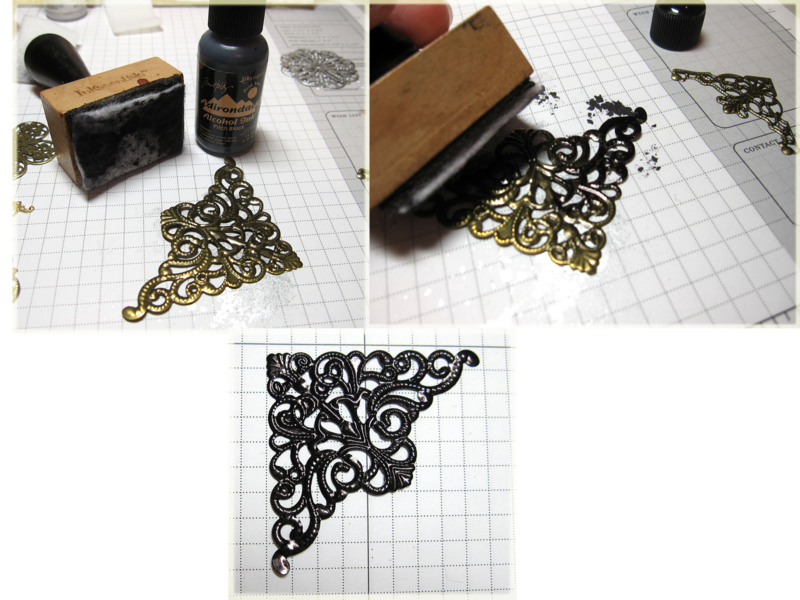 Just a quick endorsement of that stamping ink - it is truly the best stamping ink I have ever used. You get great coverage even with stamps with lots of rubber, it stamps crisp and clean, dries fast but not too fast and is embossable! I use it for all my black stamping needs. After stamping, I let the ink dry and did not wipe it off the embossed areas. 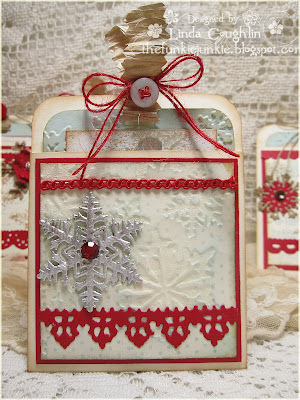 From the confetti cream CS, I used the Movers and Shapers large ticket die to cut a ticket. (I love this die and it is becoming a favorite go-to for me.) I stamped it with the same stamp I used to stamp the front panel and then sponged it with Vintage Photo. 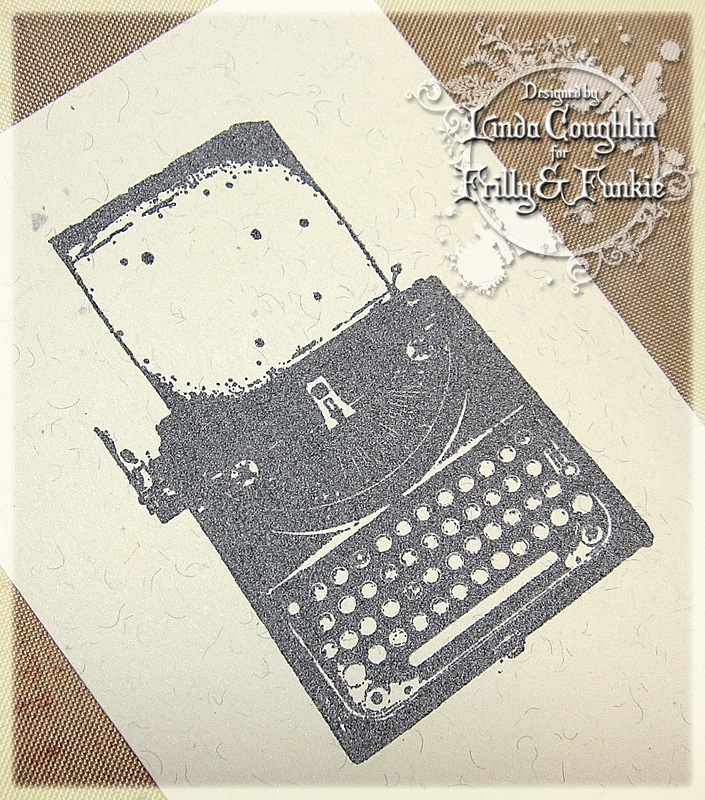 I stamped the typewriter with the Jet Black Archival ink and applied clear embossing powder. 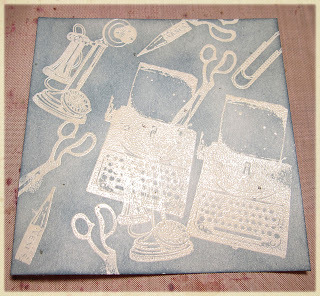 You can see in this photo how well the embossing powder stuck. The typewriter and the four pencils were stamped with Jet Black Archival Ink and clear embossed. Since I found out how well the archival ink embosses, I have stopped using black EP - I hate how it is so messy and I always seem to have a few black dots where the EP strayed and I didn't see it before I heated it. That is all totally avoided by using the Jet Black Archival Ink and clear EP. Now comes the fun part. I started thinking about those vintage manual typewriters and the stinkin' ribbon came to mind. Yuck! When the ribbon wore out, you had to remove the reels on both sides and insert a new pair with new ribbon rolled on one and then sort of thread the ribbon through the guides that kept it in place when it scrolled back and forth. It was a messy, inky job. I decided to recreate one of the ribbon reels using a piece of rayon seam binding and copic markers. I used R08 Vermillion and 100 Black, first making a thin line down the middle with the red and then filling in the red. When I neared the center, I colored very lightly so as not to saturate the seam binding with ink that would bleed to the other half. Once the red half was colored, I made a thin line of black and then colored that in the same way. I created a reel with two round filigree metals altered to black with Pitch Black alcohol ink. I rolled a piece of black CS that was just about 2/8" wider than then "ribbon" and glued it to the filigree metal with Claudine Hellmuth's Multi Medium Matte. When dry, I glued one end of the "ribbon" to the reel and then glued the top part of the reel with more Claudine MMM. A second round filigree metal was then glued to the top in the same manner. I made reinforcements with the Tim Holtz Tag and Bookplate die. You don't have to have the die to make them - just punch a small circle and take your hole punch and punch out the center. I did that forever before I owned that cool tag die. But I really like how the die cut the reinforcements so I used that. I hung the typewriter key charms with mini paperclips threaded through the reinforcements and clipped them on with a Tin Holtz clip. The mini paperclips and the typerwriter key charms are TH too. All are either in the boutique or expected next week. I got word that a major Ranger shipment should be here next Tuesday. That is pretty much it for this card. I really had a blast making it and I think it stands out as one of my favorites of all that I have made. Let me know if you have any questions! Welcome to our very first Friday Focus here at Frilly and Funkie. We're very happy you are taking the time today to check out our Friday Focus Product Spotlight. Every Friday one of our designers will introduce you to a favorite product that is sold in the Funkie Junkie boutique. And lucky for you, that product will be on sale for 15% off in the boutique for one week, until the next Friday Focus. So you will always want to start your Fridays with Friday focus! 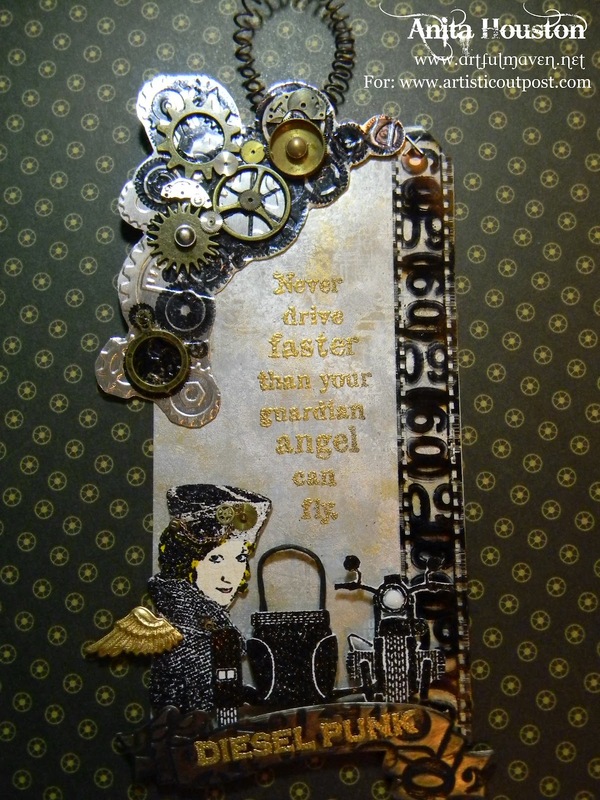 I love using metals on my papercrafts and mixed media projects. I've spent a lot of time tracking down cool little bits of metal that you can use on your cards, layouts and mixed media. Most of the embellishments in the boutique are bronze tone metal and are wonderful to use as is. 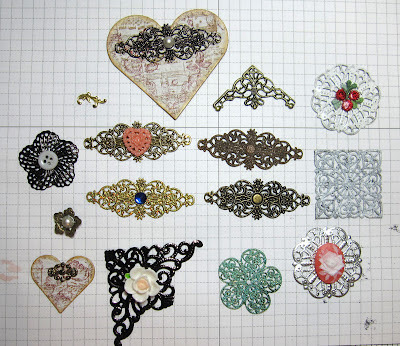 But sometimes you want to take it up a notch which you can do by altering and embellishing your metals. Another cool way to alter metal is to use one of the Ranger Alcohol Ink Mixitives on your metal piece. Here I have used the silver mixitive. 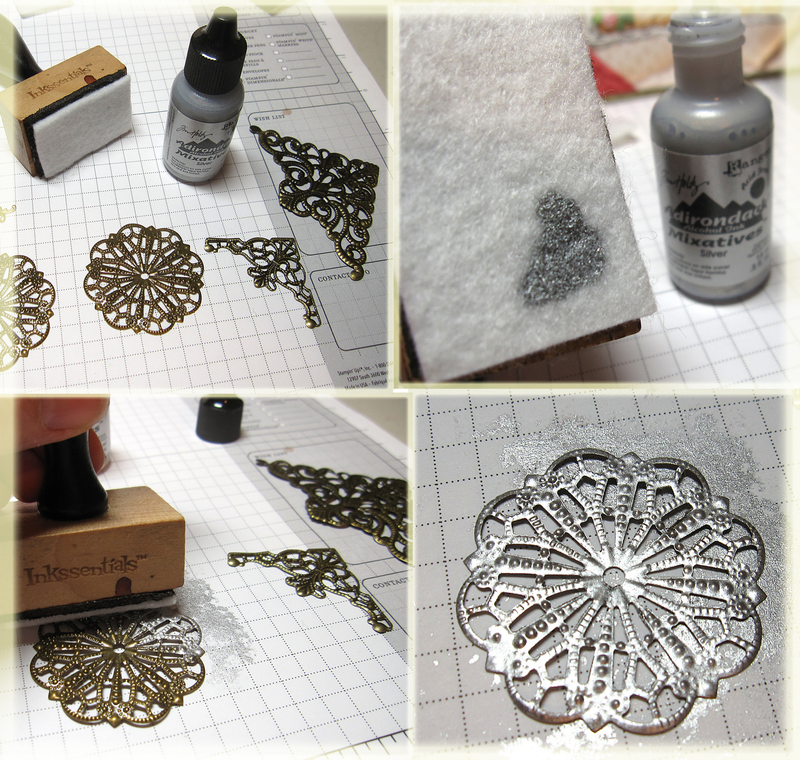 I think my favorite way of embellishing the filigree metals is to heat emboss them. It's quick and easy. 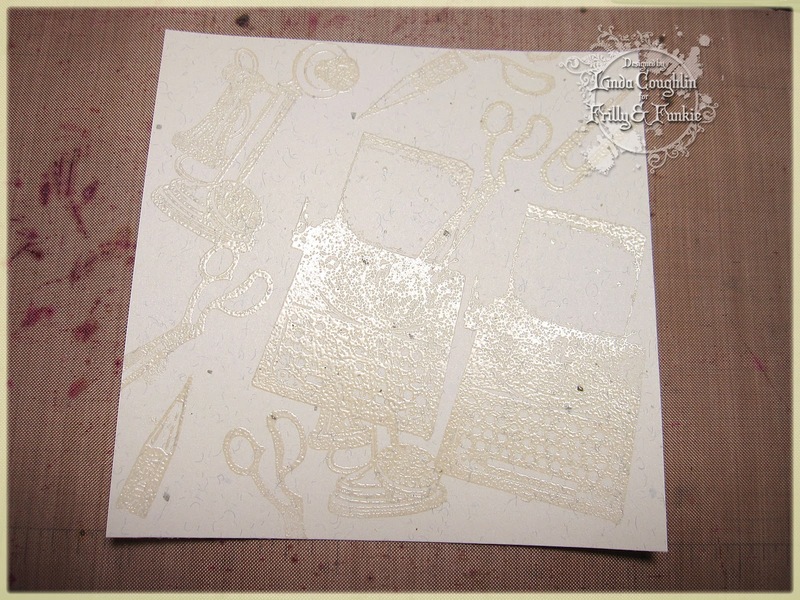 Smoosh your metal down into your embossing ink pad and emboss - careful, it does stay hot a few moments. I sanded some of the high points to make it look worn and distressed. 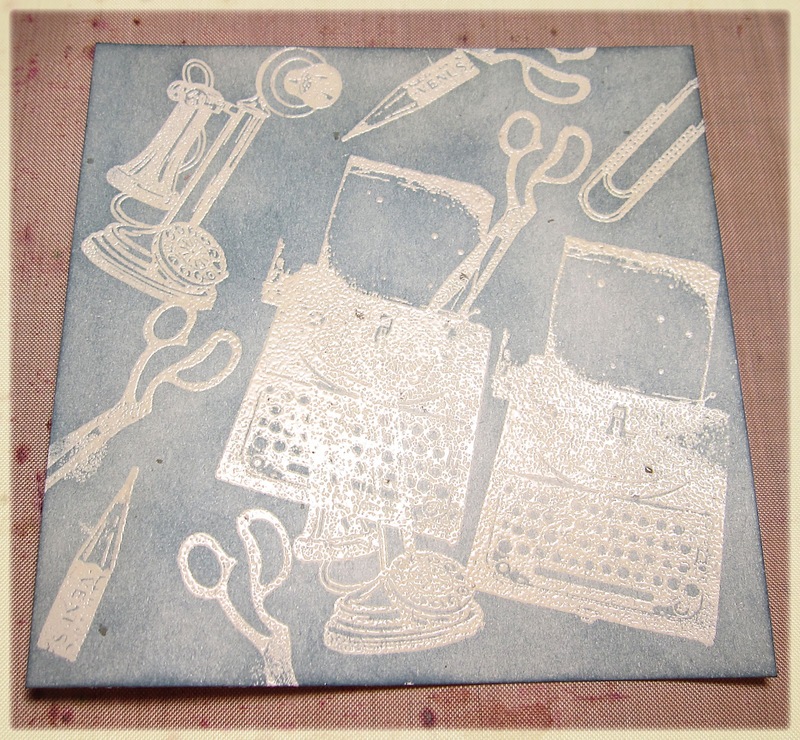 Alterations include white, black and silver acrylic paint, embossing powder as follows: white, verdigris and Vintage Photo distress EP. There you have it. Just some fun little ways to spice up your work. If you are interested in purchasing some of the filigree metals, shop here. Everything in the Filigree Metals category is reduced by 15% between Friday and Thursday, April 5th. And don't forget, you can get 10% off on your entire purchase by using MARCH10 at checkout. Shop early - supplies are limited! We Want to Be Your Favorite Vintage Stop! Find out here who won the $25 kick off gift certificate! Welcome to the kick off challenge for the new Frilly and Funkie challenge. We are all about vintage here at Frilly and Funkie. It's a place for your vintage, your style, your way. All interpretations of the vintage genre are welcome. We're going to mix it up and have some fun! Our normal challenge format will be a new challenge theme every other Wednesday morning. The first week, our Frilly designers will post their take on the theme and the second week the Funkie designers will share their interpretation of the theme. However for our kick off, the challenge will be only one week and all our designers will share their take on the challenge theme. Our theme for the kick off will be Your Favorite Vintage Style. Now it's time for you to share with us. Don't forget, you can get your Frilly and Funkie crafting supplies, including amazing prices on Ranger products, at The Funkie Junkie Boutique. 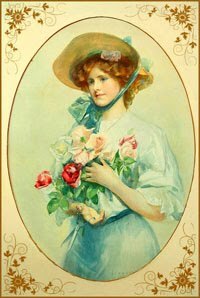 There are still a few more days this month to use the March 10% off coupon. That's right, get 10% off your entire order for just trying out The Funkie Junkie Boutique. Use the coupon code MARCH10 at checkout. of the kick-off drawing and it's Sara S. Congratulations Sara - you win a $25 shopping spree at the Funkie Junkie Boutique and you can combine your shopping with the 10% off MARCH10 coupon and save even more on the Friday Focus featured product at 15% off starting on Friday. Woohoo, what a haul you can make for very little money if you choose! Please contact me at thefunkiejunkie@gmail.com so I can give you your gift certificate code. Thank you so much to all of you who took the time to get to know us by visiting our blogs. 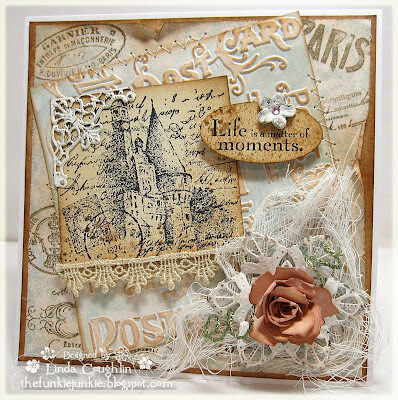 Now we encourage you to play along with our first challenge the theme of which is Your Favorite Vintage Style. Have You Visited All the New DT Blogs to Qualify for the Kick-off Drawing? Hey Frilly and Funkie Fans, don't forget that we are celebrating our challenge kick off with a drawing for a $25 gift certificate to the Funkie Junkie Boutique. To qualify for the gift certificate, you will need to go to each of the new DT member's blog and leave a comment there. Then please come back here and enter by leaving a comment on this post. Only the names entered here via the comment section will be in the random drawing. The contest will close at 12:00 midnight EDT on March 28th. The winner will be announced on Thursday, March 29th. Here's a blog roll of our new designers. Hello everyone! 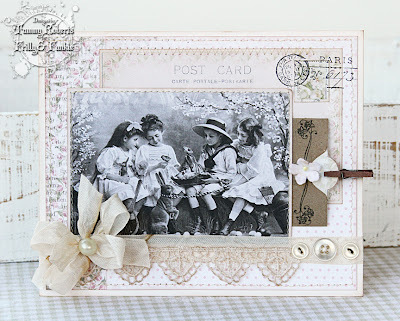 I think I am the last of new Design Team reveal for the Frilly and Funkie challenge blog so, let me introduce myself! My name is Tammy Roberts and I am so excited and honored to have been asked to join the "Frilly" side of this amazing Design Team. I love creating and have been doing so for as long as I can remember. I have done all things crafty like embroidery, quilting, drawings, decorating for parties... you name, I have probably tried it. I started scrapbooking about 12 years ago and instantly fell in love with it. Now, I love to create anything with paper and all the sweet embellishments I can find... sweet shabby/vintage embellishments, that is. My heart and style belongs to the softer, sweet side of shabby/vintage and that makes me a perfect fit for the "frilly" side of the Design Team. I have created a special card for you... to give you an idea of what you will be seeing from me. I have had the privilege of being on Design Teams such as Graphic 45, Crafty Secrets and The Shabby Tea Room as well as being published in several magazines. I just love this hobby and I look forward to making new friends here and working with all the other talented ladies on this fun crafting journey! Be sure to visit all of the Design Team blogs and leave a comment on each one for a chance to win the fabulous $25 gift certificate to The Funkie Junkie Boutique... the winner will be announced on March 28th! 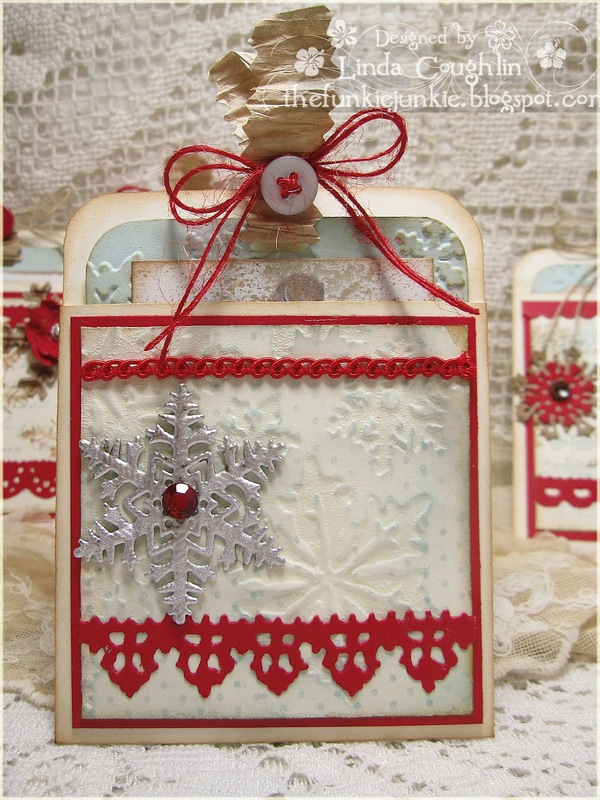 You can visit my blog at Paperie Sweetness. Hello everyone crafty! I am Anita Houston, of the Artful Maven Haven, and I am deeply honored to have been asked to be a "Funkie" Design Team member here at Frilly and Funkie! I have been creating things ever since I could hold a crayon, and I have pretty much dabbled in everything (not oils yet), but after attending a Tim class back in 2007, I was hooked and taken in by the 'dark side'! 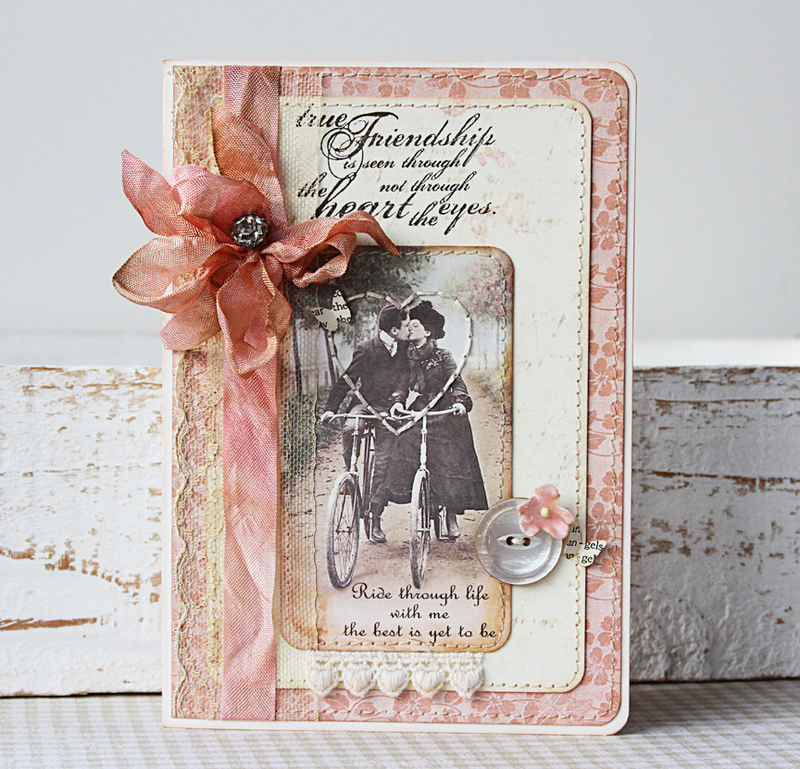 I love vintage and antiqued everything! My favorite creative messes are usually some sort of 3D thing with wings, paint, metals, or wood! I love getting my hands dirty with craftiness...it's my favorite kind of work! Here is a tag I created last year when I first started blogging. 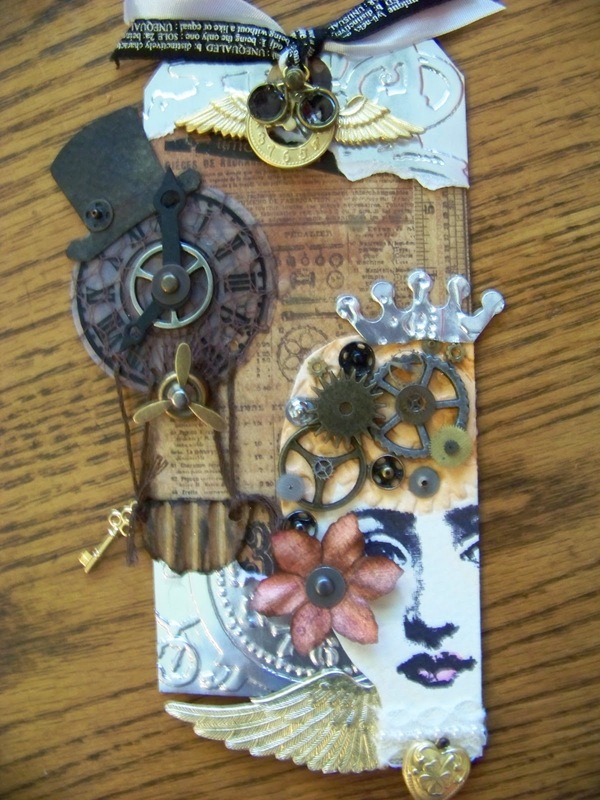 It is probably my very favorite tag, as I put in the hours for this one, and it's the first time I ever dabbled in the SteamPunk genre. Please don't forget about our random drawing bonus! On the 28th, when we have our first challenge, we will announce a random drawn winner out of all those who visited every single DT blog and left a comment. The winner will receive a $25 gift certificate to the Funkie Junkie boutique. I am sure I will be making new friends with so many of you out there, and I hope all of you join in on all this inky fun! I look forward to working with and learning from this very talented Design Team, and I am uber excited to be a part of Linda's new creative journey! Hello everyone! 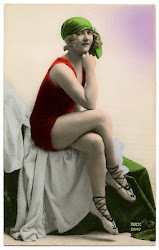 Its my turn to introduce myself as part of the Frilly side of the DT. I'm still pinching myself that I was invited to join such a fabulous team and can't wait to get started on this new craft journey. I hope to meet some blogging friends along the way ! So, a little about me, my name is Sue and I live in the UK and have been crafting in some style or other for as long as I can remember. I absolutely adore inks and paints and rubber stamps, and well everything that I can get really messy with ! My style, I guess, is a shabby, vintage, distressed kind of style, though I always find it hard to put myself in a particular category. I'll leave it up to you to decide ! 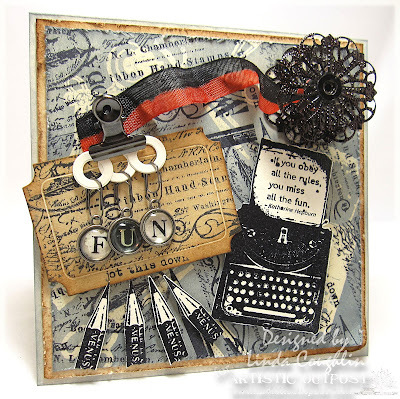 I've been on several DT's, currently they are The Stamp Man, Fashionable Stamping Challenge and Katzelkraft. Prior to these I was on I Love ProMarkers, Passion for ProMarkers, ABC challenge, Isabella's Sketchbook, and have had guest spots on several more. To give you a flavour of my work the card I'm sharing is quite recent, and was made for a very special friend. If you want to check out more of my work, and of course leave a comment to be in with a chance of winning the $25 prize to spend in Linda's fabulous Funkie Junkie Boutique, you can find me here. 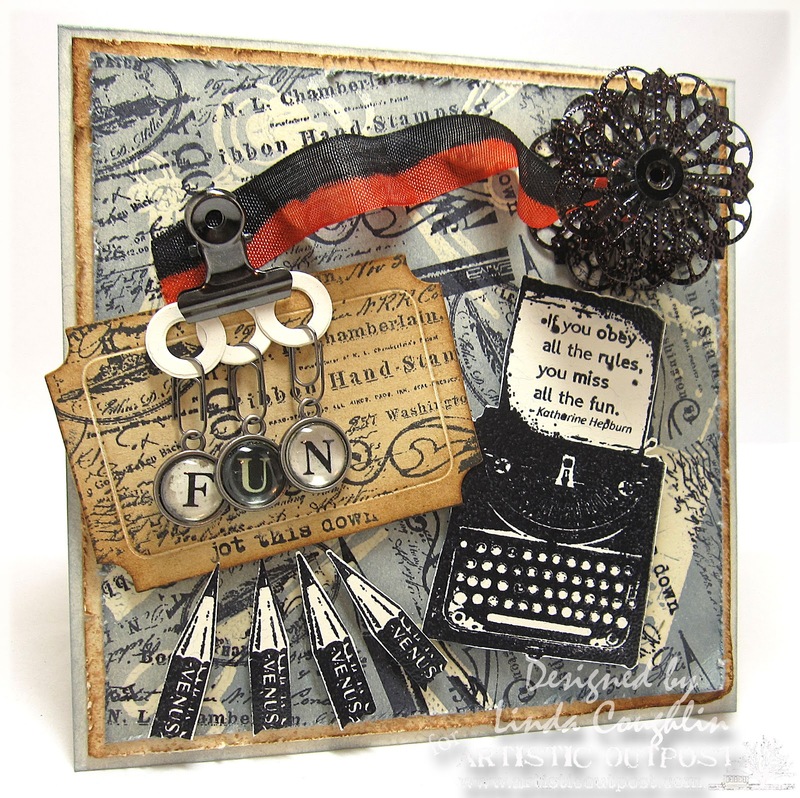 Hello, I am Terry and part of the Funkie design team for the new "Frilly and Funkie" challenge blog! I am thrilled to be part of this new and exciting adventure and I am so looking forward to getting to know all of you Frilly and Funkie bloggers! I am going to keep my introduction short as you will get to know more about me and my art during the F&F challenges, which will be a blast. Honestly, I don't know my style, so I would have to say that I am eclectic at best! There is no doubt that I am drawn to the more grungy and funky side and try whenever possible to add a little humorous twist! 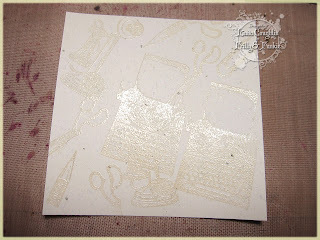 In 2007, I was invited to a Stampin Up workshop and it was "OK" and then I went to a stamping convention months later! Well I saw Mr. Tim Holtz in action and realized there is so much more to this "inking Madness" and the rest is history! You can visit my blog to have a closer look at who I am! Remember to visit all of the Frilly and Funkie design team blogs during this reveal and leave a comment for a chance to win a $25.00 gift certificate to Linda's Zibbet shop! Hello frilly and funkie friends....I am Teresa Kline from Paperie Blooms; my creative journey is expanding and I super excited to share it with you! I am so looking forward to our new challenges and learning all kinds of new things from the DT and you. 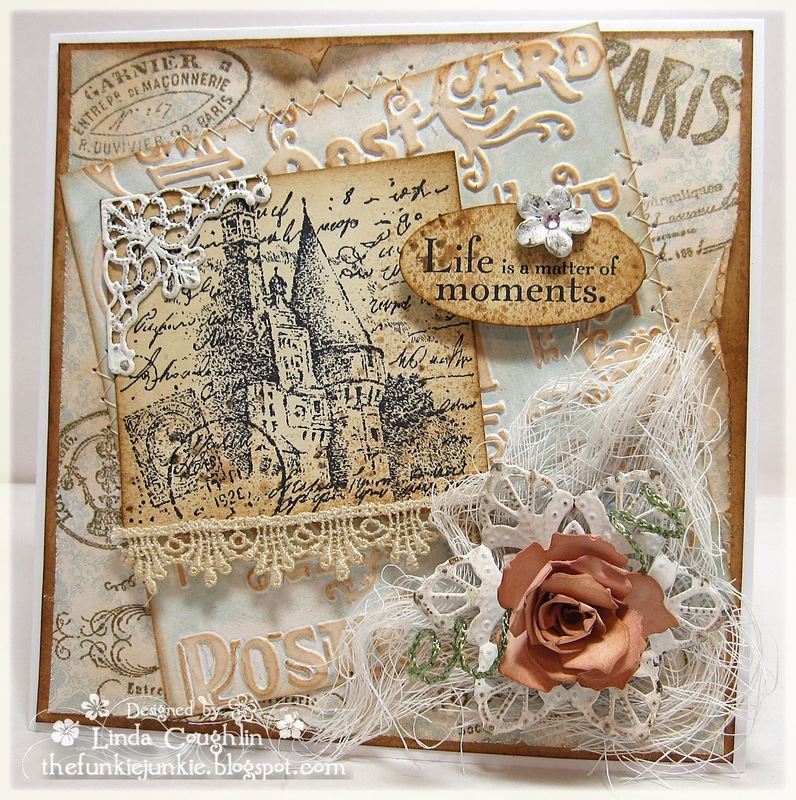 I have been creating cards for five years, I started after a Stampin Up party and it has exploded from there. I have been on numerous design teams in the past; Sweet and Sassy, Stampers Dream. I have held guest spots for Our Daily Bread, My Time Made Easy, and Layers of Color. I am currently on the Verve and Lil' Inker design teams and I am a SCS Dirty Dozen alumni. I am on several challenge teams Mojo Monday Sketch, Waltzingmouse Sketch, CASE Study and now Frilly & Funkie. 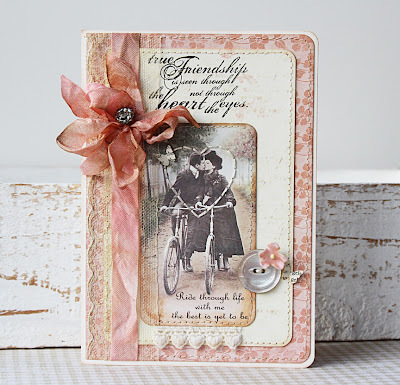 I have also guested for lots of challenge teams as well; The Color Throwdown, Just Us Girls(twice), Shabby Tea Room, Friday MashUP, Stampin Sisters in Christ, and For Your Inspiration to name a few. So from the list you can see I luv to stamp and create! I like sending my cards to people in our church, friends, neighbors, anyone who needs encouraging; I also donate lots of cards. As far as style, I do not like to "label" myself...lol...I truly luv all styles of creating! 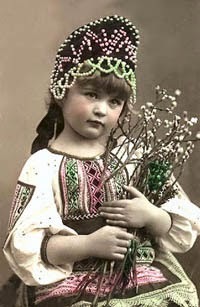 But, I have been told that I tend to be on the shabby/chic style. I adore, stitching, distressing, button, bows, lace, and frills....so I guess you could say I am a frilly girl...teehehehe. I am looking soooo forward to this team, the adventure, and expanding my style. I look forward to getting to know you and I hope that you are inspired by my work! I’m so happy be one of the Funkies here at Frilly and Funkie. 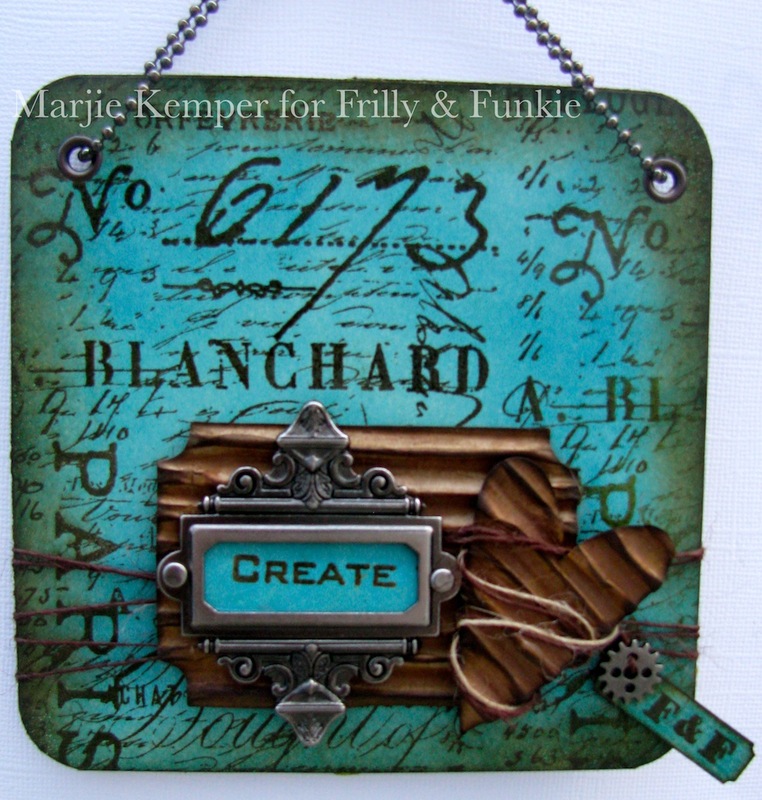 I’m a long-time scrapper and stamper, drawn especially to the style of Tim Holtz, 7 Gypsies, and all things grungy. 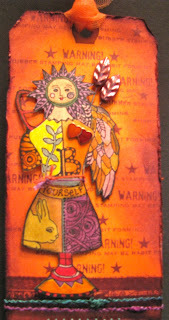 I love stamping, scrapping, collage, mixed media, and art journaling. Distress inks are a part of nearly everything I do, and I'm a huge fan of stencils, sprays, paints, and mists. I make tags, cards, artist trading cards, scrapbook pages, canvases and home decor pieces. Please stop by my blog and have a look around. Looking forward to participating in all the fun challenges here at F&F! 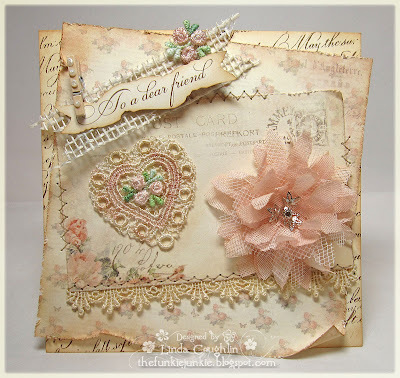 Welcome to the Frilly and Funkie challenge blog, a place where vintage is cherished and celebrated in all its many forms. Whether your favorite style is shabby chic, vintage grunge or retro, you'll find lots to inspire you here every week. Our first challenge will be Wednesday, March 28 and all our designers we will share their favorite vintage style. After that, we will have bi-weekly challenges but you will get to see new work from our designers every week. We have split our team into two styles - the Frillies and the Funkies. The Frillies will post their interpretation of the challenge theme the first week of the challenge. The following week, the Funkies will post their interpretation of the challenge. Whatever your style, you can play along any time during the two weeks the challenge is open. We are so excited to start the kick off. For the next seven days we are going to tease you by revealing who is on our new design team, one designer each day. We hope you will visit each one of them and leave them some love and encouragement. On March 28th, our official start date, we will do a random drawing of all those who left comments on every designer's blog and that person will win a $25 gift certificate to my Funkie Junkie Boutique. Once you finish visiting all the blogs, please come back here and sign up for the drawing using the linky system that will be the top post here on March 27th. And now a little about me. 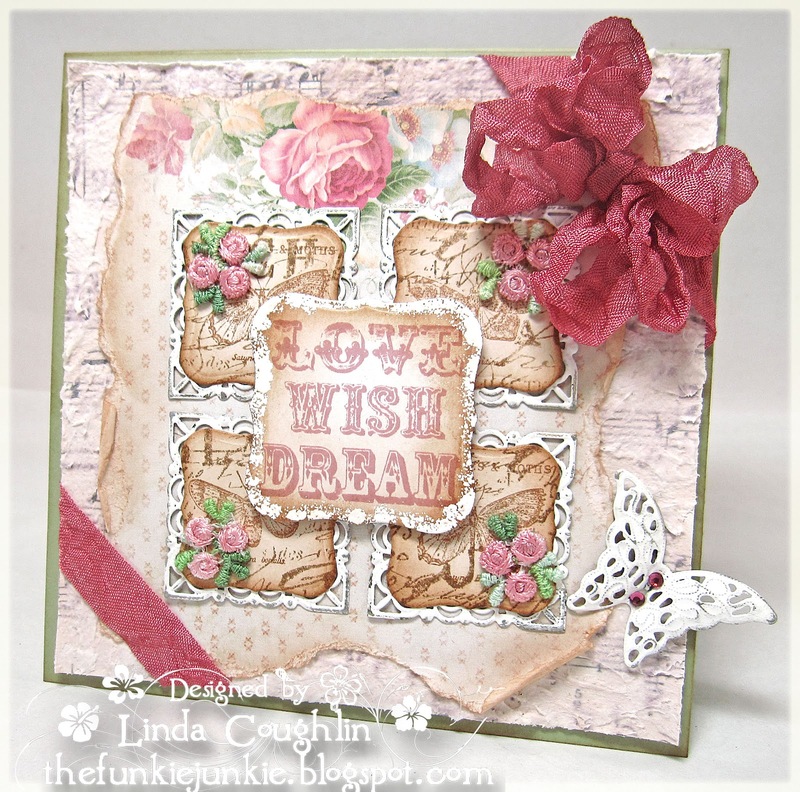 I'm Linda Coughlin also know as The Funkie Junkie with a blog of the same name. I am the owner of this blog as well as the Our Creative Corner challenge blog. I've been on a number of design teams over the past few years including Our Creative Corner, Creative Card Crew, Creative Inspirations Wednesday Challenge, Pile it On, The Prairie Fairy, Isabella's Sketchbook, Sugar Creek Hollow and Simon Says Stamp and Show. 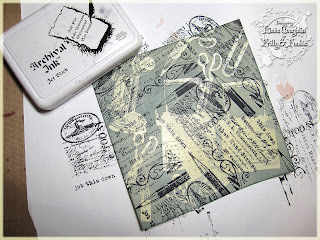 I've been a guest designer for JustRite Stamps, The Shabby Tea Room and am currently doing a five month guest designer spot for Artistic Outpost. A year ago, I started a small Etsy boutique selling-out-of-the-mainstream craft supplies. I recently moved my shop over to Zibbet and it is growing but I do not and will not be selling everything the big on-line superstores sell. My aim is to stay boutique size - a place you can go to find different and somewhat unique types of craft supplies and receive hand-touched packaging and stellar customer service. That said, I will admit that my love of Ranger products has propelled me into the decision to carry Ranger products also. 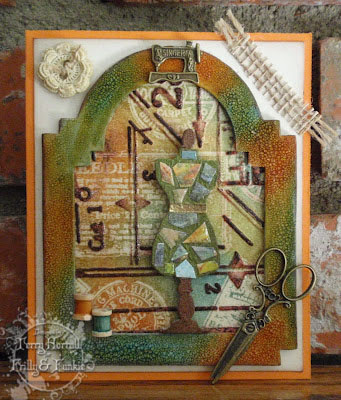 My crafting style is on the shabby side of vintage, but I love working with the artsy, grungy stuff too. So you will see me playing on both the Frilly and the Funkie sides of the team from time to time. I'm super excited to be starting this challenge blog. We are going to have lots of things happening every week. Check out our Weekly Schedule of Events tab up top and sign up as a follower or for our emails so you don't miss a thing.